A “blaze” I found in the Rio Grande Gorge in northern New Mexico last spring. “Where warm waters halt… where warm waters halt… where warm waters halt.” For two summers, I’ve been exploring the Rocky Mountains with those words on my mind. Why those four words in particular? Because I believe they lead to a modern-day treasure chest. In 2010, Forrest Fenn, a retired antiquities dealer based in Santa Fe, N.M., set about creating his own legend: He bought an antique bronze chest and filled it with valuables and artifacts including gold dust, coins and nuggets, Chinese jade carvings, a 17th-century gold-and-emerald ring, an ancient turquoise bracelet — together worth between $1 million and $2 million — and then lugged all 19 kilograms of it to a mysterious hiding place somewhere “in the Rocky Mountains north of Santa Fe.” He then released a poem containing nine clues as to the treasure’s whereabouts. More than four years later, nobody has yet found Fenn’s treasure, and he maintains that if it goes undiscovered, the chest will stay safely in place for hundreds of years. The Fenn treasure has been valued between $1 million and $2 million and the chest itself — a 12th-century Roman lockbox made of sculpted bronze — has been said to be worth about $35,000. Credit: Forrest Fenn. Thousands of people from all walks of life have gone searching for Fenn’s treasure in New Mexico, Colorado, Wyoming and Montana (Fenn has eliminated Utah and Idaho). When I heard about the treasure, I couldn’t help thinking about it from a geologist’s point of view: The poem implies that the treasure is hidden near water, but the courses of waterways can change drastically over time, even from season to season, let alone over centuries. And as someone interested in archaeology and paleontology, I’m well aware that if you find something interesting on public land, it’s not always “finders, keepers.” I was intrigued. Could I put my background in geology and my hiker’s knowledge of landscapes to work searching for a treasure chest? Follow my treasure hunt here in my latest feature for EARTH magazine! This entry was posted in Hiking!, New Mexico, Photography, Road tripping!, Science Writing, Sustainable Living, Vagabonding 101. Bookmark the permalink. 14 Responses to Where Warm Waters Halt…On the Trail of Treasure in the Rocky Mountains! Thanks for sharing the Earth article. Very interesting story about a very interesting man. What a fascinating and captivating story! Mr. Fenn is obviously a special person. If it were me, at 80 years of age, I would contribute another clue each year to make it more likely the treasure would be found. What would be the fun if I died and never knew? A treasure that unique should never, in my humble opinion, be lost forever. Perhaps Mr. Fenn should tell one other person the location of the treasure in the event of his death. Or a map in a safe deposit box? Of course the greatest treasures were never intended to be hidden. Great Earth magazine piece! But I’m not gonna go treasure-hunting. Outlet from a hot springs? Hmm. Might need a road trip to search. Great story! Fascinating story! Hope you’re enjoying winter! The treasure is not so much the contents of the box, the treasure is the illusion of locating the box and the journey. Just imagine all the people who will read this, and live the adventure vicariously thru you, and never leave their home. You are so fortunate, unlike those left behind, that cannot trek out into the wilderness and search for whatever your/their heart requires. Funny how the mind will work, I have the same thing bouncing around in my head, almost constantly. A man, two pack horses and a dog, every year he goes into the Rockies and stays two weeks, just him and that old dog. Oh great, like I had so much time on my hands. I had never heard anything about this story. Now you have me hooked…..big time. Your story has stirred something deep within me. Maybe a longing for the long summer days of being a kid and trekking through the woods looking for treasure. I have my first site located and cannot wait to make the long journey with my teardrop trailer to pick up my just reward. If I find it, I will share some with you, as without this story, I never would have gone looking. Very nice blog, inspiring in many ways. 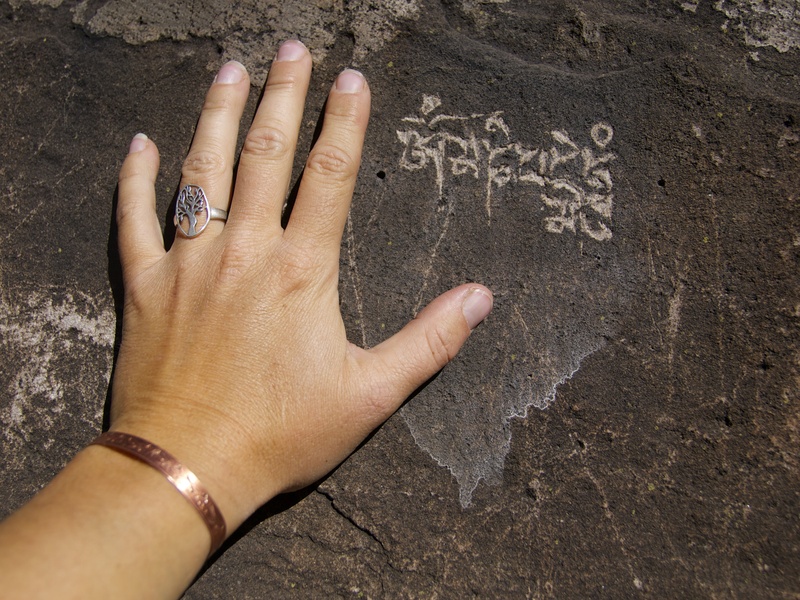 I would just like to add, in case it hasn’t already been pointed out to you, that the “blaze” that you found in the Rio Grand Gorge is Tibetan script. It says Om Mani Padme Hung, the most well-known of Tibetan Buddhist mantras, and found carved in holy places throughout Tibet. it’s also very well done, I suspect by a native Tibetan or a well-informed Westerner. As far as the meaning goes, that’s a secret treasure! Excellent article. Best I’ve read on The Chase during years of research.